Choose Chicago, the marketing organization for the city of Chicago, came to the Institute of Design to create a vision of the future. Choose Chicago operates in several ways: as a visitor information center, a website, and a planner for large events such as the NFL Draft. The problem was that Choose Chicago was loosing state and city funding and thus was closing down it's visitor information center. So the question was, "How do we create a great experience for visitors without a visitor information center?" 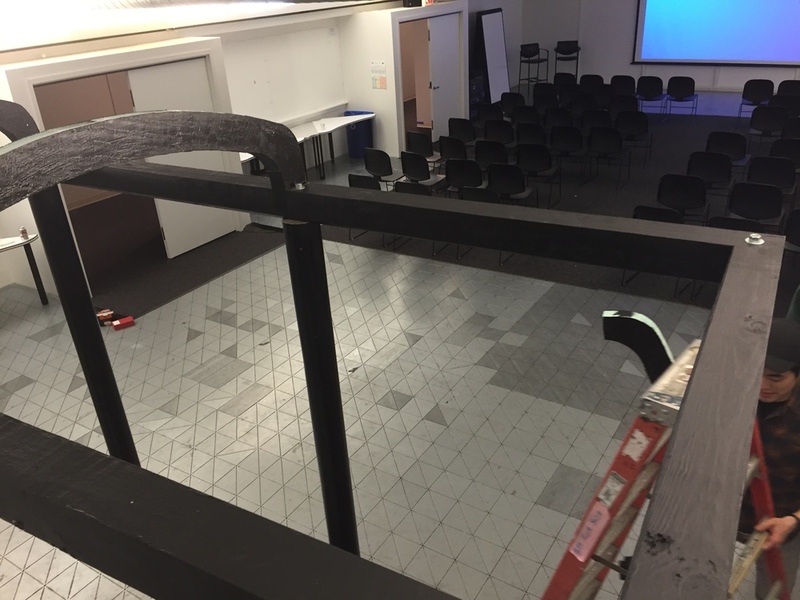 We worked on this project with continuous feedback from leaders of Choose Chicago. Each week we would present our research and findings to the group or do participatory workshops to help the team understand Choose Chicago's perspectives on the problem. Involving the internal stakeholders from the beginning was extremely important. From them we were able to uncover orthodoxies, limitations of the organization, and white spaces for innovation. In our research and analysis, we talked to locals, tourists, employees at the VIC, and internal stakeholders. What we found was that there was no replacement for human-to-human contact. This human-to-human contact created trust and personalized experiences. Visitors to the center would say that they felt comfortable speaking with tour guides or employees at the VIC because they knew that they would get real advice from somebody they trusted. In the realm of persuasive design, this kind of contact plays on social proof, liking, authority, limited choice, and tunneling (to name a few). Unfortunately, with the VIC closing, we had to manufacture this trust in other ways. With this in mind, we created experience maps and personas to understand the ambitions, anxieties, attitudes, and actions of visitors. This helped us gain empathy for our users. We were then able to better know where there were "bright spots" and where the current experience was lacking. I find that personas are misused fairly frequently as a means to an end. What should be gleaned from personas are patterns and meaningful stories. If understanding users is one piece of the puzzle, understanding the systems and capabilities behind the scenes are another. 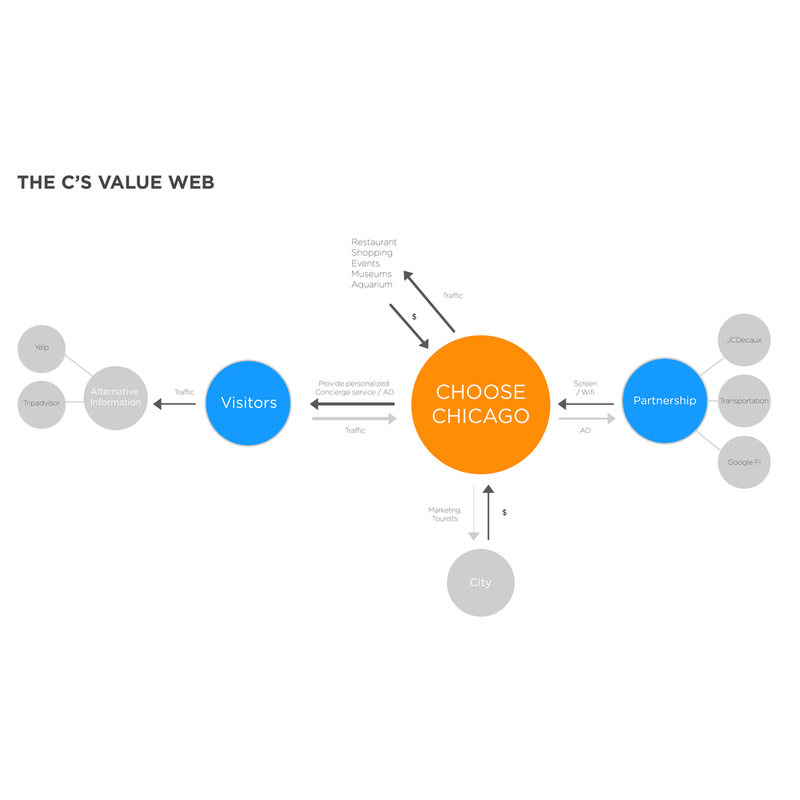 We mapped out value webs and entity capability maps to understand where value stood to be created and who might be able to provide this value. The solution must allow for flexible access. The technology should be simple to use with user interactions going only three to four levels deep. The solution must target locals and tourists. The interaction should utilize the existing person to person concierge service. The solution must not require a one-use app. The startup costs must be low enough to generate sign-on with government officials. Upkeep costs must be minimal both in terms of monetary and human capital. 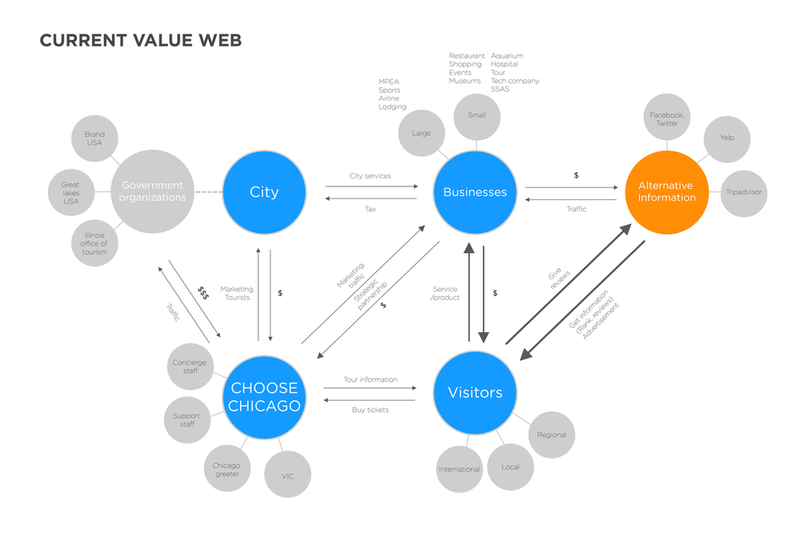 The solution must enable Choose Chicago to collect information and metrics so that the city may better know how to serve its visitors. The solution must generate revenue for the city and this revenue should be able to be easily tracked to the solution. The interaction should encourage people to become either passive or active evangelists for the city. Our final solution took what we knew was great about the VIC and married it with already existing infrastructure around the city and available partners. We knew that users were weary about downloading one-time, location-specific apps. Additionally, there were issues around competition as people already use Yelp, Trip Advisor, etc. and a city-run platform would not be able to compete. We decided to focus on partnerships and utilize bus stops located around the city so that we could create a sort of "exploded VIC" where the human-to-human aspect that would be possible in a visitor center could be possible anywhere. In creating immersive experiences, we could differentiate from already existing technologies and offer greater value to users beyond the simple pamphlet. Not only can this solution be possible anywhere in Chicago, but it could be used as a marketing tool in other cities.